U.S. Secretary of State John Kerry says America remains committed to implementing the Paris climate agreement and described the document as the product of years of hard labour that cannot be allowed to erode. The Paris Agreement was the final product of the climate negotiations in Paris, France last year, adopted by consensus of the 195 UNFCCC participating member states to reduce emissions and combat climate change. As part of the agreement, it was recommended that developed nations provide $100 billion funding annually to assist developing countries – who are least responsible for the problem of climate change, but more vulnerable to its impacts – to implement projects for mitigation and adaptation. Addressing his last climate conference as Secretary of State, Kerry said that in the past years, America had worked exceedingly hard in funding and developing innovative solutions to climate induced challenges, and was not going back. “No one can deny the progress that we have made in the past. The progress we made today is beyond Paris. A few weeks ago I was in Kigali. Access to affordable energy is key. 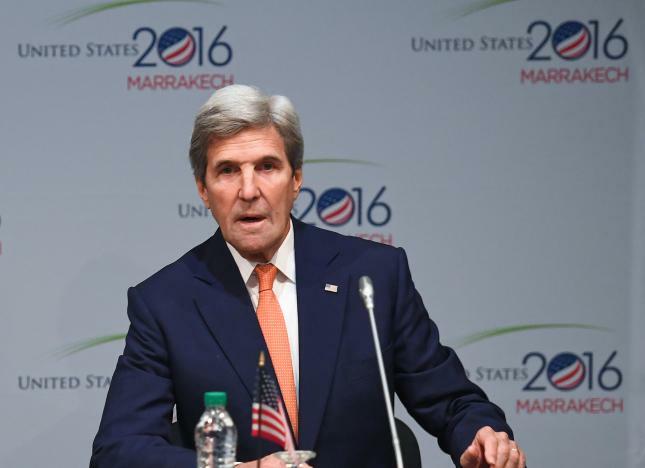 Time is not on our side,” Kerry said, as his remarks prompted widespread applause. America’s incoming president, Donald Trump, was quoted recently as saying that climate change was only a hoax and threatened to pull his country out of the landmark Paris deal, a decision analysts claim would enable the country save $100 billion over eight years. Kerry said the impacts of climate change including severe flooding and other disasters that have cost America billions of dollars and increased the vulnerability of many citizens. Necessary things must be done, Kerry said, to protect them and those in other countries. He warned that leaders should not play politics with climate change because it is indeed real and its impacts are ravaging people across the globe. “Climate change shouldn’t be a partisan issue. About 109 countries representing global emissions agreed to tackle the issue. We should act in diverse ways, including deploying infrastructure and science as well as technology to help vulnerable people,” he remarked. John Kerry said the role of the private sector in driving solutions to climate change is important. But he warned that while the private sector is needed in funding, political leaders themselves must be committed for the desired result to be achieved. “Government leadership is critical in protecting the environment and tackling climate change. We should do what is required," he said. Some parties who watched Kerry speak said they were concerned that he might be speaking from the point of view of President Obama, which could be contrary to the decisions of President-elect Trump. But for a country that ranks second after China in global greenhouse emissions, actors from developing countries feel that if America pulls out of the Paris Agreement as Trump has threatened, it would be a big moral disservice to countries whose development is threatened by climate change they did not cause. U.S. Special Envoy for Climate Change, Dr. Jonathan Pershing, had said on Tuesday during a COP22 news briefing that the Paris Agreement is inclusive and takes ambitious steps to solving world’s greatest environment disaster, but the decision is that of the new government in his country to make. He said, “As we all know, soon we will see a transition to a new presidential administration in the United States. In the coming weeks, we expect personnel from the transition team to arrive at the State Department and begin planning the shape and thrust of American diplomacy for the next four years. At this time, I do not have information about when that process will start or who will play a role in it, and I cannot speak for the President-elect’s team, or to their outlook on international climate policy. “What I do know, however, is the power of the movement and the enormous momentum created in Paris and built throughout the year since. Parties are deeply interested in seeing this work bear real fruit. With the Agreement having entered into force, it is no longer a question of whether to accelerate the Agreement’s implementation – but rather a question of when and how.